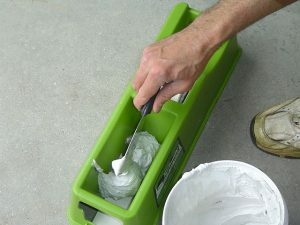 When tackling a do it yourself drywall project one of the most difficult tasks is applying drywall tape to the joints. It is even more difficult if adjoining drywall panels are not flush with each other or there are large gaps in between the panels. When taping drywall joints it is critical that a sufficient and even amount of joint compound be applied behind the drywall tape so that the tape adheres well to the joints and to prevent bubbling. 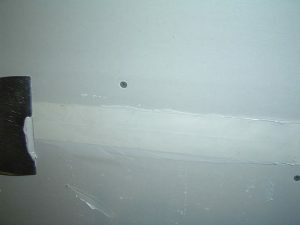 The basic technique is to first apply joint compound over the seams and then imbed the drywall tape into the joint compound. Again, this takes time and practice and frequently results in a less than professional look for the first time do it yourself drywallers. One way to tape drywall like the pros is to use a drywall tape machine. There are a variety of drywall tape machines that have been available on the market for years, including drywall banjos and bazookas, however they are heavy and clumsy devices that take quite a bit of time and practice to learn how to use them properly. In addition, they are fairly expensive, particularly if you only expect to use them once in a great while. One of the best drywall tape machines that I have used is the “TapeBuddy”. 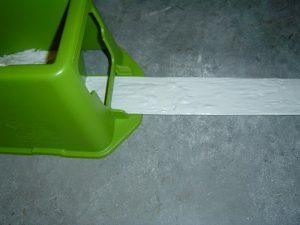 This is a simple yet clever drywall tape machine that ensures an even application of joint compound to the drywall tape. It also dramatically speeds up the drywall taping time. The TapeBuddy drywall tape machine is constructed out of a heavy gauge plastic, and consists of two molded wells. One well is for holding a roll of paper drywall tape, and the other well is for holding joint compound. There are slits at the base of each well for allowing the drywall tape to slide through the base of the TapeBuddy. To use the TapeBuddy drywall tape machine you first install a bridge insert piece that comes with the device, into the base of it. This bridge insert piece controls the joint compound application thickness to the drywall tape. Next, you place a roll of drywall tape into the tape well, and thread the tape through the opening in the bottom of the well. You then slide the drywall tape through the joint compound well and finally out a slit where you can pull the tape out as you need it. Once the drywall tape has been installed into the Tape Buddy, you next fill the joint compound well with “All Purpose Joint Compound”. After you have loaded the TapeBuddy with joint compound it is ready for use. With one hand on the TapeBuddy use your other hand to pull the tape straight out. Swing the tape upwards as you pull it out to the desired length. Use a corner of your drywall taping knife to cut the tape approximately 1 inch from the end of the out-feed slit. This action will leave you enough of a tab to pull the next piece of drywall tape. Apply the mudded sided of the tape to the drywall joint. Use your drywall taping knife to embed the tape into the joint. Gently draw the drywall taping knife along the tape to firmly imbed the tape into the seam. It is important to not squeeze out too much joint compound from behind the tape to prevent the tape from not adhering well to the drywall panels. Once you have smoothed out the tape area, let it dry. After the tape has fully dried, you can then go back and add top coats to achieve a professional finish. So, before undertaking your next drywall taping project, check out the TapeBuddy from Buddy Tools, LLC. It is easy to use, and takes virtually no time or practice in getting familiar with. The Tape Buddy applies a perfect and consistent amount of joint compound to the drywall tape every time. 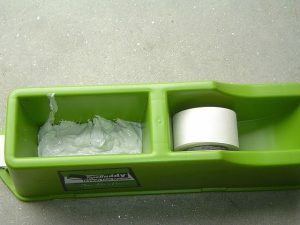 All you need to do is simply pull the tape out as you need it and apply it to the drywall joints with your taping knife.